Review disclaimer: I was given these polishes so that I could review them. I am expected to give my honest review, in exchange for the polishes. Let's start off with Not The Droids You're Looking For, shall we? First off, in case you're not a big Star Wars fan, I figured I would break the ice with a clip that I found on Youtube. It is indicative of the real scene but it's Lego (R) so it makes it that much cooler. 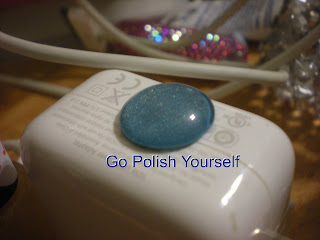 Now that you know where the polish's name comes from, here's the polish itself! 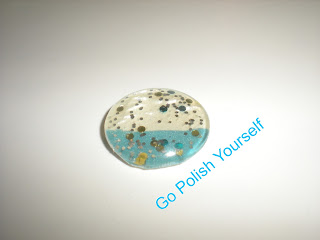 Lovely right? Holy Macro Batman! Would you look at this?! Below are my pictures of Not The Droids You're Looking For on my nails. 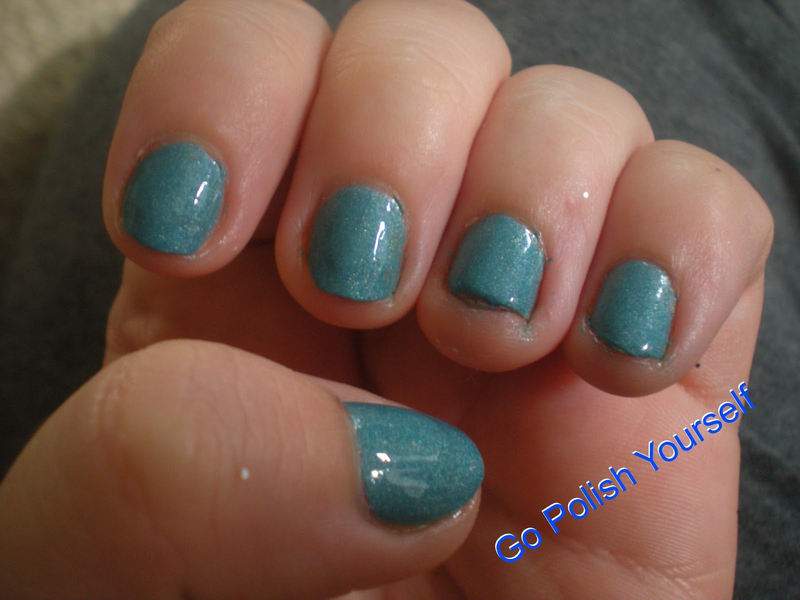 I did two coat of the polish over ManGlaze ILF. 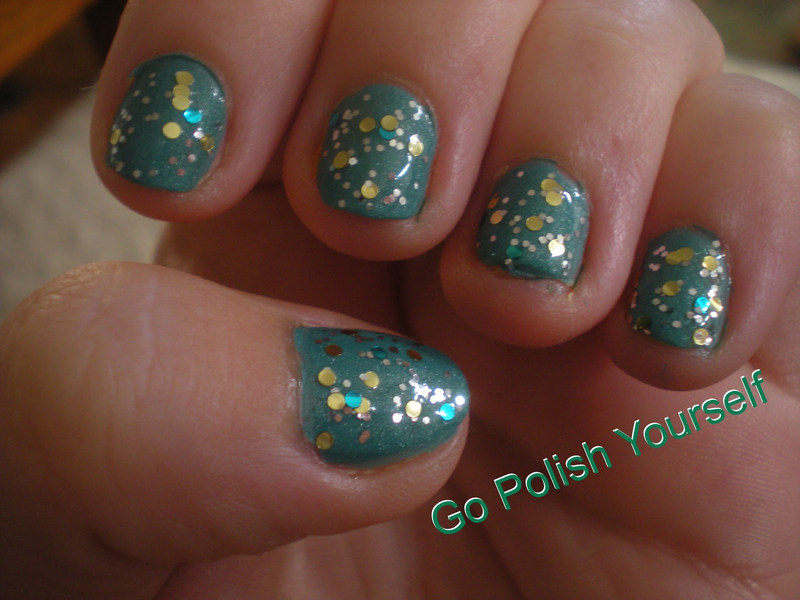 I think the two work really well together, as the dark teal from ILF accentuates the gold and light teal glitters! 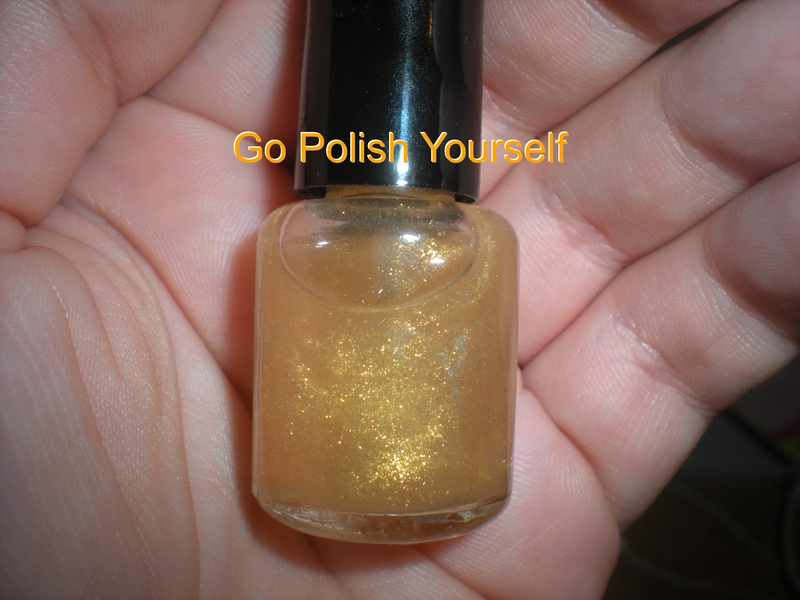 The last thing I wanted to show you with this polish is how perfect it is when it's matted. I did just the thumb by itself, but you can tell that the matte texture enhanced the natural colors of the glitters and by taking the shine off of them, to me, made it that much more beautiful. 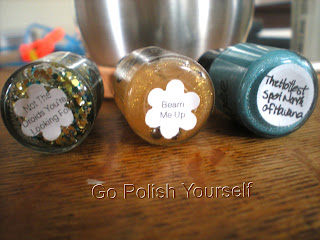 Next we move on to the other polish in the Sci-Fi Geeks Collection: Beam Me Up! Now that you have seen it, I hope you realize how dazzling this polish is! 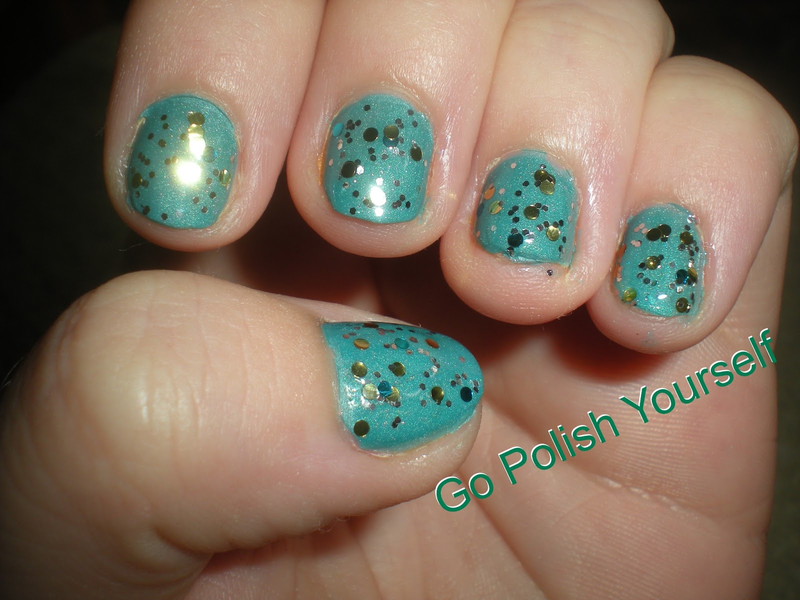 This polish has a clear base, so it makes this polish very subtle, but DO NOT be fooled! 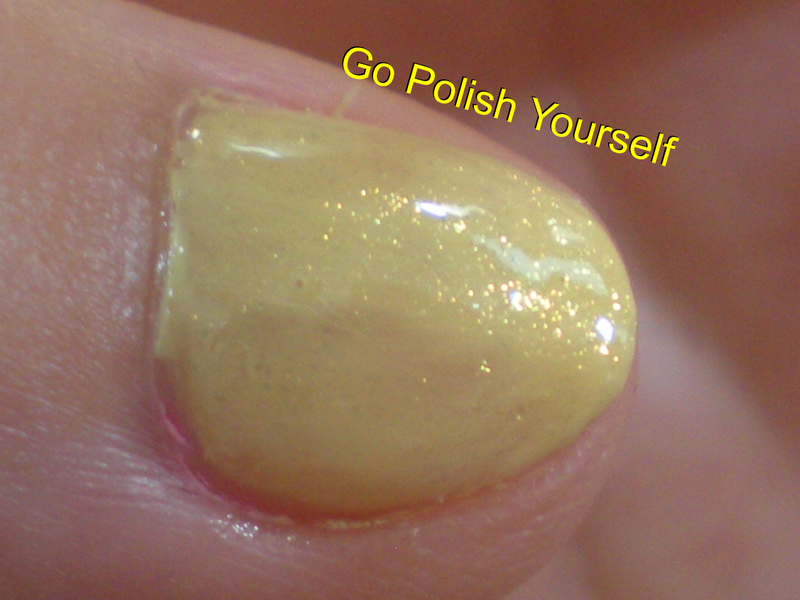 This is a polish that can stand up with the rest of the golds on the market! 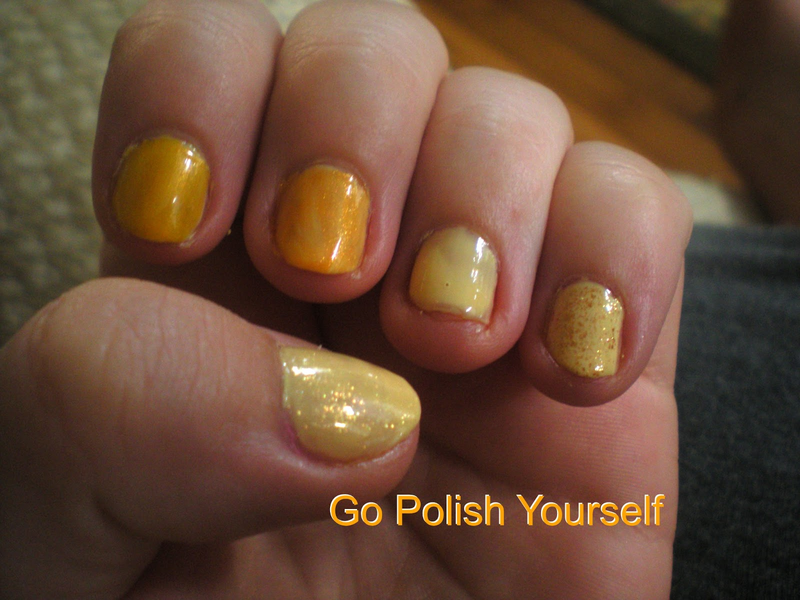 To illustrate this, I did a comparison shot of some other famous golds/ oranges! Ellagee's polish is the winner by a landslide! 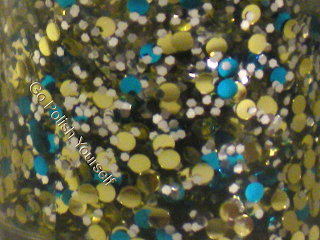 To make this even more easy to tell, I have magnified the image, so that you can see the beautiful golden glitters, whether it is in the macro bottle shot on the left, or in the nail shot on the right. the Hottest Spot North of Havana! 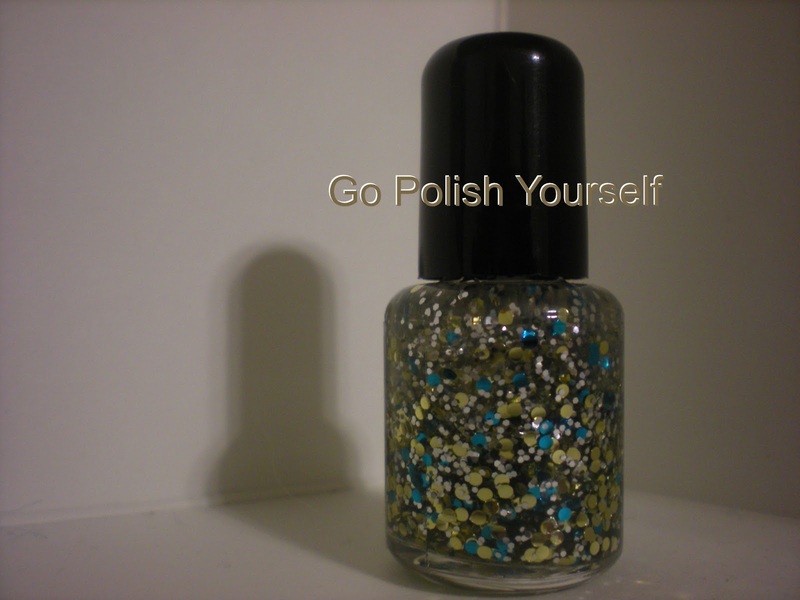 Just want to preface the rest of this post by saying this is my favorite holo. 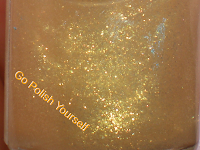 That's right I said it! My favorite holo!! 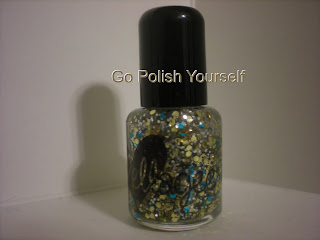 That's how amazing this holo is! 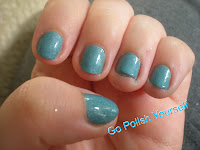 Not even mentioning that my favorite color is blue, and my favorite shade is medium blue, not sky, but not navy, that color in the middle; this is still a heck of a polish! Let me explain, the shade of blue that the amazing lady Laura behind Ellagee has used accentuates the shimmery glittery goodness that is the holo in her polish. This polish to me is like the color of the sky post rain, where it's just calming down after the stormy rain and wind. Here's my thumb pic which shows what I wasn't able to show before, just how beautiful this holo-y masterpiece is! These polishes inspired me to do something I don't often do. That is making rings using the polishes! 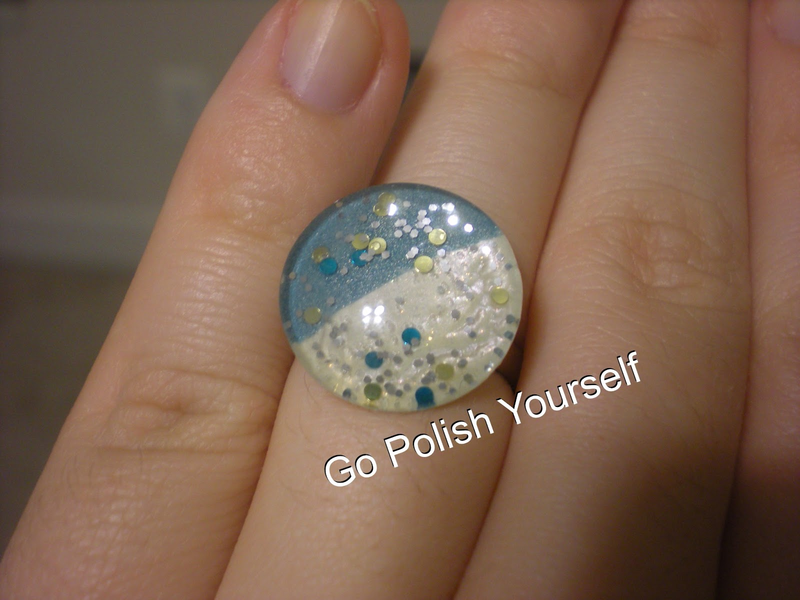 I used the Hottest Spot North of Havana to make the ring cabochon in the top picture and used all three polishes to make the subsequent cabochons, with the last picture being the final ring product!